The senior wide receiver is back after a knee injury cut his 2017 season short. ORONO — Micah Wright looked out at the football field at Alfond Stadium with a smile. Wright, the standout senior wide receiver for the University of Maine, is expected to participate in the Black Bears’ second intrasquad scrimmage Monday afternoon. It will be his first full-contact experience since Nov. 4, when he tore the anterior cruciate ligament of his right knee in a game against Delaware at Fitzpatrick Stadium in Portland. Wearing a brace on his right knee, he’s been running drills and catching passes in practices, but was held out of the team’s first scrimmage last week. Now he’s been medically cleared to take hits and the Black Bears can’t wait to get him into the flow of their offense. 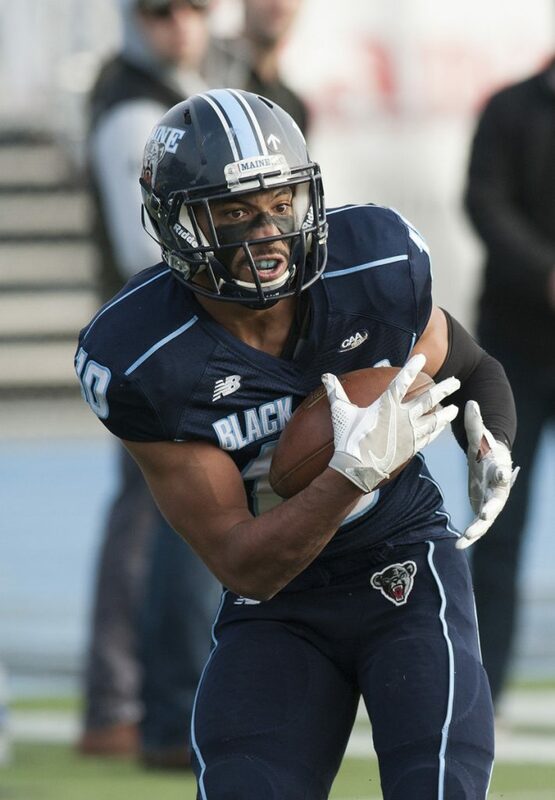 Wright is regarded as one of the most dangerous offensive players not only on the Black Bears but in the Colonial Athletic Association, where he was a first-team all-conference wide receiver and second-team punt returner in 2016. The last two seasons, injuries and two suspensions have limited Wright to 14 of Maine’s 21 games. Last year he was one of the three players suspended for an off-field incident before the season and missed the first three games. He played in five, catching 13 passes for 150 yards and two touchdowns, then missed the last two after his injury. The other two players are no longer with the team. Defensive lineman Uchenna Egwuonwu transferred to Division II Linwood University and running back Darian Davis-Ray is, according to Coach Joe Harasymiak, academically ineligible to play. Wright said he’s learned from his mistakes, which include a two-game suspension at the start of the 2016 season for an off-field incident, and wants to make this a special year. “I’m much better mentally and physically I’m much better,” he said. “I’m around my guys and it doesn’t get much better than this, playing football and being around my teammates. Those close to Wright say he hasn’t changed much, but they have noticed him being more vocal and demonstrative during drills. Charlton said Wright has learned from his travails. Wright said he simply wants to make sure the team, coming off a 4-6 season, is moving in the right direction. “We lost a lot of leaders from last year,” said Wright. “It was hard being on the sidelines all winter. I tried to be vocal. And since I’ve been back I’m trying to make sure everyone is on the same page, trying to be great every day. If Maine’s offense is going to be great, it’s a good bet Wright will be involved. While Maine has playmakers, such as Earnest Edwards (17.7 yards per catch, four touchdowns) and Jaquan Blair (10.5 yards per catch), Wright is a gamebreaker. In 28 career games he’s caught 15 touchdown passes and averaged 14.0 yards on 121 catches. He’s also returned two punts for touchdowns, including a 77-yarder last year that helped Maine overcome an early deficit en route to a 51-27 victory over Rhode Island. Ferguson spent a lot of time working with Wright over the summer, trying to create some chemistry between the two. And the Black Bears are looking for him to do it again.